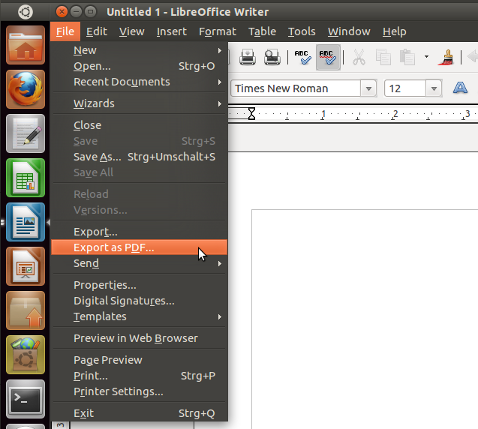 Does anyone know how to convert an ODT file (LibreOffice) to PDF? Note: Only starting from Ubuntu 11.10 unoconv depends on Libre Office. Previous unoconv versions (from Ubuntu <= 11.04) depend on Open Office (but it will also run with Libre Office). Here are a few more details about the "non-GUI" method. You can use this method not only to convert ODT files to PDF. It will also work for MS Word DOCX files (it will work as well as LibreOffice is able to handle the particular ODT), and, in general all file types which LibreOffice can open. I do not think that there is a binary named libreoffice as one of the other answers suggested. However, there is soffice(.bin) -- the binary that can be used to start LibreOffice from the command line. It is usually located in /usr/lib/libreoffice/program/; and very often, a symlink /usr/bin/soffice points to that location. Be sure to follow exactly this capitalization! This will create a new, separate environment which can be used by a second, headless LO instance without interfering with a possibly running first GUI LO instance started by the same user. It may be a problem with the specific DOCX file you try the command with... So create a very simple DOCX document of your own first. Use LibreOffice itself for this. Write "Hello World!" on an otherwise empty page. Save it as DOCX. Try again. Does it work with the simple DOCX? If it again doesn't work, repeat step 7, but save as ODT this time. Repeat step 8, but make sure to reference the ODT this time. $ /path/to/libreoffice -h  # if that path exists, which I doubt! Do you get an output here? For which one of the three binaries/symlinks? Are there any changes in parameter names, capitalizations, number of dashes used, etc.?? --headless     like invisible but no user interaction at all. --infilter="Microsoft Word 2007-2013 XML Template"
--infilter="Microsoft Word 2007 XML Template"
--infilter="MS Word 2007 XML Template"
This script utilizes libreoffice to convert files compatible with LibreOffice to PDF. base="`python -c 'import gio,sys; print(gio.File(sys.argv).get_path())' $NAUTILUS_SCRIPT_CURRENT_URI`"
libreoffice --headless --invisible --convert-to pdf --outdir "$base" "$document"
For installation instructions see here: How can I install a Nautilus script? Note: I decided to delete my answer from this question and to post a modified version of it here when I realised that unoconv doesn't deal with psw files at all well, and doesn't convert them successfully to other formats. There may also be problems with docx and xlsx formats. You could use the command-line libreoffice convert utility or unoconv, which is available in the repositories. I find unoconv to be very useful, and it is probably what you want. Even though Takkat has briefly mentioned unoconv, I thought it would be useful to give some more details and a batch conversion one-liner. If you later want to use any other file formats, just substitute the odt and pdf for any other supported input and output formats. You can find the supported formats for a file type by entering unoconv -f odt --show. To convert a single file use, for example, unoconv -f pdf myfile.odt. Further information on and options for the program can be found by entering in terminal man unoconv or by going to the Ubuntu manpages online. Not the answer you're looking for? Browse other questions tagged libreoffice pdf openoffice.org or ask your own question. How to convert pdf file to an odt file? How to convert Powerpoint ppsx (presentation) to pdf? How do I convert Pocket Word files (PSW) to ODT? How to convert .tex into .odt? How to convert .odt to latex? How can I convert .BOK file to .PDF file in Ubuntu?